Pastor is crispy shavings of vertical spit-roasted pork marinated with dried chiles and spices. Very similar to shawarma or doner kebab, pastor was influenced by the strong Lebanese migration that occurred in Mexico in the early 1940’s. In 1959, Guillermo Buendía and Amelia González started the business in a one-by-one-meter location. Due to the size, clients would refer to the taco shop as a “huequito,” meaning a very small space in Spanish. 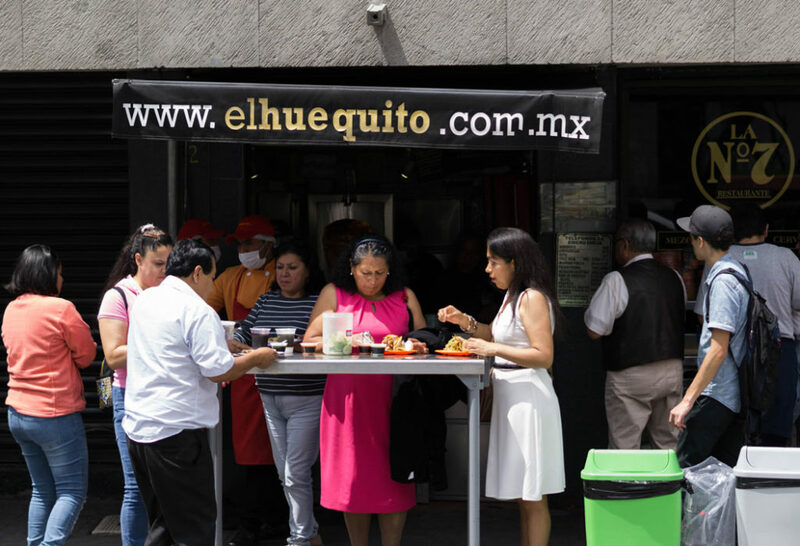 The tacos al pastor at El Huequito are different than all the rest in Mexico City. No pineapple and no cilantro here. Just freshly shaved pastor meat wrapped in a tortilla with a little green salsa, chile de árbol salsa and onion, then straight back on the grill to seal in the flavor. 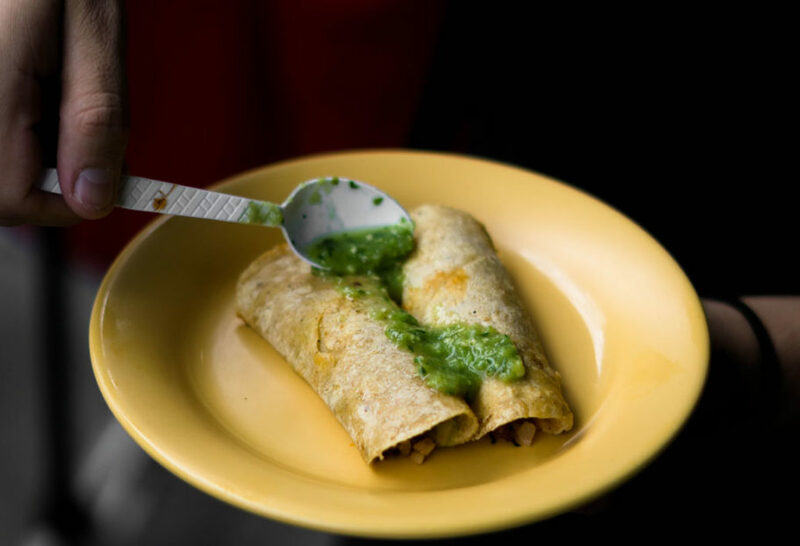 If you visit one of El Huequito’s newer locations, like the one in Condesa neighborhood, you’ll experience a longer menu with classics such as the especial — a mountain of pastor topped with corn tortillas, onion and green salsa, so you can make your own tacos. A couple tacos al pastor with an ice-cold agua de horchata is probably one of the best combinations that exists in Mexico City’s street food scene today. Hace 42 años yo trabajé en la torre de Teléfonos de México a una cuadra de El Huequito, y para mi y mis amigas era uno de nuestros lugares favoritos para ir a comer tacos al pastor. Ya no vivo en Ciudad de México pero iré a El Huequito en cuanto tenga una oportunidad. FELICIDADES POR TANTO ÉXITO!!!! Me and my sons stop by to try thise tacos the best al pastor taco ever!!! So glad you all had a yummy time, Hector. oh my goodness these look so yummy. It has been entirely way too long since I have had any kind of good street tacos. I miss them so much here in Oklahoma where there’s not a vendor to be found. Luv it…I am anxiously anticipating your new year..Luv Mexican foods but not cilantro…My sister-in-law is from Tijuana….she cooks great …Uses a lot of cilantro…..
You can always skip the cilantro in my recipes, Doris. Hope you love the new episodes! Yes, for sure next time, Oscar! So excited for the new season I guess we will miss seeing Alan too. Best of luck to him. You have such delicious recipes. Live interaction with your children. Great family. God Bless. Oh thank you so much, Philomena! I can hardly wait for your new season! Love watching you create!!! Sounds great to me! I dislike cilantro which is very unfortunate for someone who loves to eat and cook Mexican food. Can’t wait for your new season. I’m so excited to share the new season with you, Don! Ooh! Great recommendation! Still have one day in CDMX- after 4 weeks here! Will see if I can sneak it it between work! Oh hope you love it, Nathalie! Always look forward to your show. I always get tips on different things to use. I don’t like cilantro, what else can I use in its place. As much as I love, really love your show, I have to say that as a Jewish person who does not eat pork, I was hoping that I could find more presentations from you not featuring pork as an ingredient. I am not speaking of Kosher, just not with pork. All the best to you and your family. I hope you enjoy living in Maryland, I miss Silver Spring so much. Thanks so much for your comment, Bruce. And I hope you get to come back to visit Silver Spring soon. Now, I am, hungry. Street food is amazing!